Constructed according to the most time-honored methods for maximum efficiency and greatest output, this machine is handcrafted of the finest-quality materials and is capable of sparks of 10+ inches in length. Each machine is made of the best-quality pattern-grade mahogany, fine sanded and tung-oil finished. All parts and fittings are hand-turned brass and linen phenolic. The 20-inch rotating discs are balanced acrylic mounted on ball-bearing bosses for smooth high-speed operation. Two Dayton AC-DC motors drive the disks, with speed regulated by a variable DC power supply providing fine-tuned speed control for all kinds of uses and experiments. The discharge electrodes, pick-up brushes, and neutralizing brushes are specifically constructed to provide maximum efficiency and output with minimum leakage. These electrodes are terminated with copper and brass spheres to offer maximum isolation, insulation, and capacity. Four Leyden jars are offered with this machine. These Leyden jars have a total capacity of 600 pF and are capable of withstanding 450 kV. 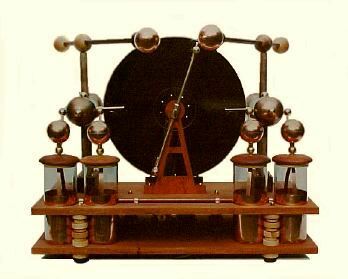 The Leyden jars may be switched in and out of the circuit while the machine is operating, and will give a thundering spark discharge of 10+ inches in length. This, our finest-quality Wimshurst machine, is named in honor of one of the truly great contributors to electrical science. Every aspect of the Nikola Tesla has been carefully considered to provide maximum operating ease, maximum output, and classic beauty. Truly a marvelous machine. Dimensions: Base: 36 inches x 20 inches. Height: 34 inches. Disk Diameter: 20 inches. Collector's Model: US$3800. FOB Ithaca, New York, USA. 16-inch and 14-inch disk-diameter versions of this machine also are available. I'm thrilled to bits with the Wimshurst machine. It works very impressively indeed even at extremely low rotational speeds. It has a jaw dropping effect on all those who have seen it. One person described it as the 'Rolls Royce' of Wimshurst machines. Praise indeed!